Random Handprints - A NYC Mom Blog... live from New Jersey: Ring in the New Year Twitter Style with MamaDrama! Ring in the New Year Twitter Style with MamaDrama! I'm joining in on the fun this Thursday night when MamaDrama is hosting a #HighHolidayHappyHour on Twitter, and I hope you will, too! We'll be sharing Rosh Hashanah traditions and ideas, and of course trading stories and recipes as well! 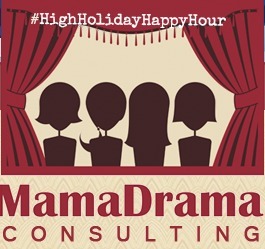 Head over to MamaDrama's Ring in the New Year Twitter Style and share in the comments that you'll be at #HighHolidayHappyHour. I was not compensated for this post or for my participation in the Twitter Party. Hmmm . . . your contest seems like it would be a good one. BUT! I can't wait to see your mom's entry! oh, i'm not gonna lie... it's good. or actually, it's bad. very bad. It's on Twitter! Join us! Hotel Transylvania: You Vant to See This Movie! Rookie USA Now Open in NYC - and a Giveaway Too!